This easy twice baked potatoes recipe is the most requested recipe in our home, especially during the holidays! It's a quick recipe that everyone loves! Peel, cut, cook and drain potatoes as you would for regular mashed potatoes. Add milk and butter and then whip together. Add egg and whip together. Add cream cheese and whip together. Add 2 cups shredded cheese and whip. At this point, you have the option to refrigerate the potatoes until you are ready to bake them. The pan is very heavy so hold on tight and make sure your shelf is secure in your refrigerator. 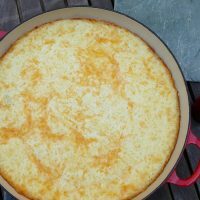 When you are ready to bake these mashed potatoes to turn them into twice baked potatoes, sprinkle two cups of shredded cheese on top and bake for one hour at 350 degrees until golden brown and crispy around the edges. We prefer our's extra crispy so leave them in an extra fifteen minutes. If you love breakfast potatoes, the leftovers are the bomb in the morning. Simply toss them in a frying pan with a bit of butter for easy breakfast potatoes.